Borrowed from the best sources the cardani looked remarkably similar to the mv, with cylinders inclined forward at 30 degrees from the vertical and its twin overhead camshafts driven by a train of pinions from the end of the crankshaft. Even the appearence of the frame was similar; Only the cardanis yellow finish and a few curves told the two machines apart. Above all, the engine layout had been adapted to the requirements of jack findlay, who had been signed as rider. no cash findlay had always favored a heavy weight bias towards the front, and had made special frames to house his engines. The cardanis engine was set well forward compared with most machines of its day. But the funds to develop the machine were lacking and it never raced. Sensibly, fontana and findlay eventually decided to use a suzuki engine in their own frame with a similar geometry which presaged the design trends of the eighties. They called the result jada. 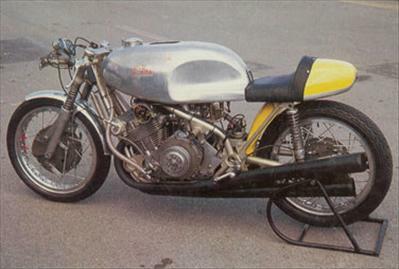 The cardani closely resembled the mv agusta which it hoped unsuccessfully to rival on the track.